Cosmo and a Santa toy from PetSmart! You can have one too! Ho ho ho! It's beginning to feel a lot like Christmas! And to help To Dog With Love readers get in a festive mood, we have a special giveaway from PetSmart today. We love the stylish sweaters from Martha Stewart Pets and the snappy holiday collars and accessories available at PetSmart, and now one lucky TDWL reader will win either a Martha Stewart Jacquard sweater in size medium OR a festive holiday collar in the size of your choice. You'll also get a surprise holiday toy to make this prize even more fun! And while you're at it, check out the rest of the gift ideas from PetSmart, and to indulge your pet even more, don't miss the new PetSmart boutique for extra-special beds, crates and accessories! One lucky winner from the U.S. or Canada will have the chance to win either a Martha Stewart dog sweater OR festive holiday collar AND a surprise toy! The winner will be chosen at random with random.org and entries must be posted on this blog by 11:59 p.m. ET on Saturday, December 10. Leave a comment on this blog post telling us you are entering our giveaway. Cosmo is dreaming of more treats! Disclosure: The products for review and giveaway were provided to TDWL free of charge by PetSmart. However, opinions expressed herein are our own. I'm entering this wonderful giveaway! Thank you. And I follow cosmo on twitter too ! I'm entering the giveaway. Thanks for hosting. 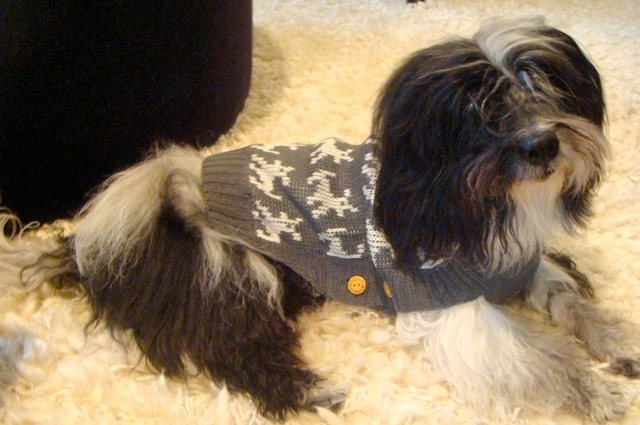 And Cosmo you look just adorable in your new sweater!